« The Bite Was Certainly On! Not much change in the weather. Still looking at 80s through the weekend and into next week. Also still looking at chances for showers almost every day except next Monday and Tuesday. We have not had as much rain as we thought we might have the past few days. Sprinkles for a little while yesterday and again today. Lots of opportunity to get out there and do some wade fishing. Water off today until 2:00 p.m. and it is projected to be off again tomorrow. One unit coming on at 2:00 p.m. for four hours. Jim out Sunday with a couple young men from Oklahoma, Preston and Grayson. Both new to fly fishing and wanted to learn how. As you can imagine, Jim took them through the paces. They were plum tuckered out when then came back to the shop. He also let them catch a few fish on the CQ streamer, ruby midge and the hot hare’s ear. Tuesday, Mike from Iowa spent the morning on the river with Stan again. They were out Sunday and had a great day, and Tuesday was more of the same. Great day on the copper dun and copperhead black midges. Jeff and Jim, from Wisconson spent the day with Jim. Very good day for these guys. Jim was pretty new so Jim worked with him on casting and technique. They caught a lot of fish, including a nice 18″ rainbow on the CQ, copper dun midge and blood worm dropper. Mike and Ethan spent Wednesday morning on the river with Stan. Ethan has been fly fishing a pond at home with his fly rod for blue gill and other warm water fish. This was both of their first experiences fly fishing for trout. Learned the importance of mending and how quickly the trout “hit and run” before you realize you just had a hit. Very good day for these guys on the black copperehead midge early in the day and then the copper dun later into the morning and early afternoon. This was Ethan’s first trout on a fly rod followed by many more. 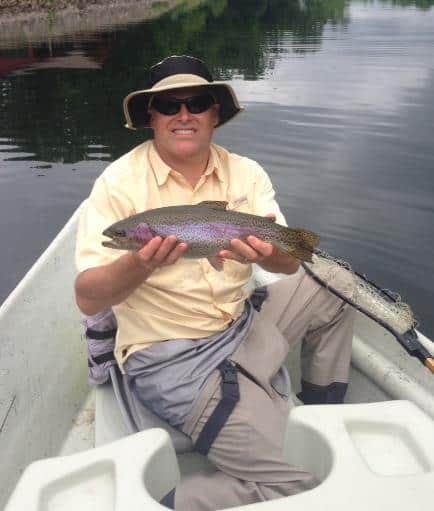 Dad did welll catching a nice 19″ rainbow. 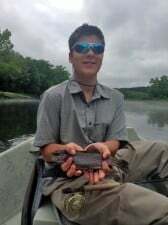 This entry was posted on Wednesday, May 28th, 2014 at 5:02 pm	and is filed under Fishing Reports. You can follow any responses to this entry through the RSS 2.0 feed. You can leave a response, or trackback from your own site.